Rajamanickam, A., Balu, K. (2016). Design and Development of Mathematical Model for Static Mixer. Iranian Journal of Chemistry and Chemical Engineering (IJCCE), 35(1), 109-116. Akila Rajamanickam; Krishnaswamy Balu. "Design and Development of Mathematical Model for Static Mixer". Iranian Journal of Chemistry and Chemical Engineering (IJCCE), 35, 1, 2016, 109-116. Rajamanickam, A., Balu, K. (2016). 'Design and Development of Mathematical Model for Static Mixer', Iranian Journal of Chemistry and Chemical Engineering (IJCCE), 35(1), pp. 109-116. Rajamanickam, A., Balu, K. Design and Development of Mathematical Model for Static Mixer. 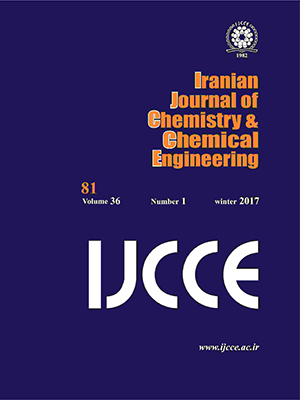 Iranian Journal of Chemistry and Chemical Engineering (IJCCE), 2016; 35(1): 109-116. A numerical model for simulating Residence Time Distribution (RTD) of turbulent flows in helical static mixers is proposed and developed to improve the understanding of static mixers. The results of this model is presented in terms of different volumetric flow rate to illustrate the complicated flow patterns that drive the mixing process in helical static mixers. The computed results are also used to predict the amount of mixing that occurs within a mixing device. Such theoretical estimates need, however, always to be thoroughly checked against observations in static mixer. To check the reliability of the theoretically estimated RTD from the simulation by the application of the model equation, a comparison of the same with those obtained from observed data experiments in static mixer using statistical characteristics is done. Comparison between RTD curves shows that motionless mixture can improve the performance of reactor. Chen M.S.K., The Theory of Micromixing for Unsteady State Flow Reactors,Chemical Engineering Science, 26: 17- 28 (1971). Bor T., Static Mixer as a Chemical Reactor, British Chemical Engineering, 16: 610-612 (1971). Champernowne D.G., An Elementary Method of Solution of the Queuing Problem with a Single Server and Constant Parameters, Journal of the Royal Statistical Society Series B, 18: 125-128 (1956). Chandarana D.I., Unverferth J.A., Residence Time Distribution of Particulate Foods at Aseptic Processing Temperatures, Journal of Food Engineering, 28: 349- 360 (1996). Charbel Habchi, Thierry Lemenand, Dominique D., Valle, Hassan Peerhossaini, Turbulent Mixing and Residence Time Distribution in Novel Multifunctional Heat Exchangers-Reactors, Chemical Engineering and Processing: Process Intensification, 49:1066-1075 (2010). Pahl M.H., Muschelknautz E., Static Mixers and Their Applications, Int. Chem. Eng., 22: 197-205 (1982). Cao Xiao-chang, Zhang Ting-an and Zhao Qiu-yue, Computational Simulation of Fluid Dynamics in a Tubular Stirred Reactor, Trans. Nonferrous met. Soc. China, 19: 489-495 (2009). Krambeck F.J., Shinnar R., Katz S., Stochastic Models For Chemical Reactors, Ind. Eng. Chem. Fund., 6(2): 276-288, (1967). Shinnar R., Naor P., Residence Time Distributions in Systems with Internal Reflux, Chemical Engineering Science, 22: 1369-1381 (1967). Mann U., Rubinovitch M., Crosby E.J., Characterization and Analysis of Continuous Recycle Systems: I. Single Unit, A.I.Ch.E. J., 25: 873-882 (1979). Mann U., Rubinovitch M., Characterization and Analysis Of Continuous Recycle Systems: II. Cascade, A.I.Ch.E.J., 27: 829-836 (1981). Rubbinovitch M., Mann U., Single-Particle Approach for Analyzing Flow Systems: I. Visits to Flow Regions, A.I.Ch.E.J., 29: 658-662 (1983). Rubinovitch M., Mann U., A Single-Particle Approach for Analyzing Flow Systems: III Multiple Fluids, A.I.Ch.E. J., 31: 615-620 (1985). Nauman, E.B., Reactions and Residence Time Distributions in Motionless Mixers, Canadian Journal of Chemical Engineering, 60:136-140 (1982). Fan L., Shen B., Chou S., Stochastic Modeling of Transient Residence Time Distribution During Start-Up, Chemical Engineering Science, 50(2): 211-221 (1995). Fan K., Fu W., Residence Time Distribution of Suspended Particle in Vertical Tube Flow, Journal of Food Science, 61(5), 982-984, (1996). Fox R.O., Fan L.T., A Master Equation Formulation for Stochastic Modelling of Mixing and Chemical Reactions in Inter-Connected Continuous Stirred Tank Reactors, "Proceedings of SCRE 8, The 8th International Symposium on Chemical Reaction Engineering", Edinburgh, Scotland (1984). Gianetto A., Baldi G., Specchia V., Sicardi S., Hydrodynamics and Solid-Liquid Contacting Effectiveness in Trickle Bed Reactors, A.I.Ch.E. J., 24(6): 1087-1104 (1978).